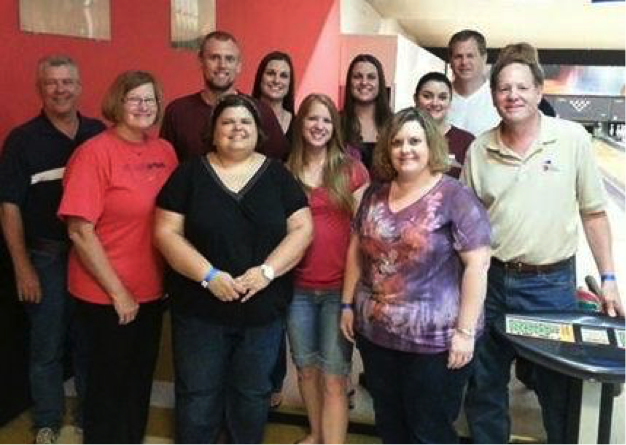 A group of Scheffel & Company, PC employees and their spouses recently participated in the Young Professionals of Alton Bowl for Charity fundraiser and silent auction at Bowl Haven. All proceeds from this fun filled evening went to the Cottage Hills Community Hope Center. The Community Hope Center is a full service emergency crisis center that helps local disadvantaged people including the homeless, children, and the elderly. Scheffel & Company CPAs Josh Andres, Jenna Bock and Julie Graham are all active members of the Young Professionals of Alton and helped coordinate the fundraiser.